This website and podcast is devoted to living closer to our food – through canning, fermenting, growing or connecting with our food on some level. That connection can include making something delicious from scratch. Well, the holidays are a perfect time to do just that while also carrying on family traditions. In this week’s episode, I talked all about making traditional steamed puddings, what makes them so special and why you should give it a try. They are NOT like fruitcake or custards. Not even close! They ARE like rich, super-moist cake or tea bread that melts in your mouth like a souffle. If you have never had one, you are in for a treat! 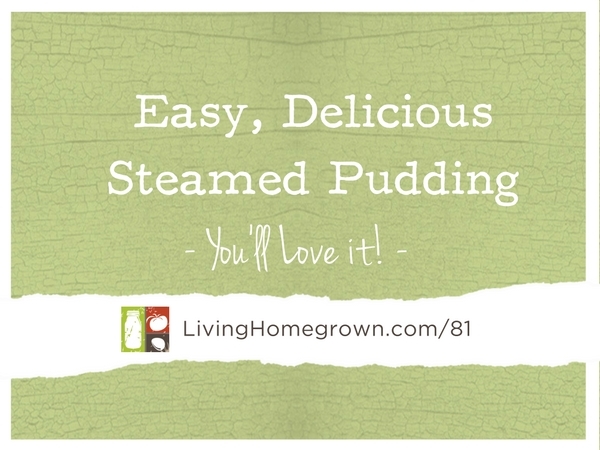 I share my family’s top two favorite recipes with tips and tricks for making a steamed pudding even if you don’t have a fancy steamer mold. Thank you for this podcast! I have been making your recipes for mocha and persimmon steamed pudding since your first video. The recipe book says 1991. Believe me, if I show up at Christmas without steamed pudding, particularly persimmon, it would be shameful! Lol! This year I will try a fig steamed pudding. I puréed and froze figs from my tree this year so fingers crossed!! Merry Christmas T! Will do! The mocha is on now. I’m excited for the fig. I’m debating as to if I should substitute fig for persimmon or try a whole new recipe. Thoughts? Hmmm – I don’t know if the fig can be substituted only because fig is not as watery as the persimmon. The result might be too dry. I would first see if you can find a fig steamed pudding. But if not, puree the fig and perhaps add a little water to get a persimmon-like consistency. Got it! ”Tis the season to experiment! Thanks for the tip!